Osave Womens PU Leather Sleeveless Motorcycle Zipper Jacket Black Rivet Moto Vest (S) by Osave at Envy This Stuff. Hurry! Limited time offer. Offer valid only while supplies last. ✿For perfect fit,please check our size chart image carefully before ordering. ✿Material：Premium PU Leather,high quality,well constructed. ✿Featuring skin friendly feeling,windbreaker,water resistance.Fashionable vest,show your elegance mostly. ✿Garment Care: Hand-wash and Dry Clean ,Low temperature ironing. 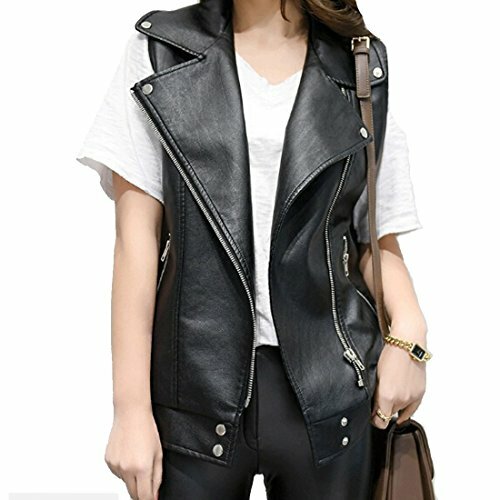 ✿Package content:1 x womens leather vest. If you have any questions about this product by Osave, contact us by completing and submitting the form below. If you are looking for a specif part number, please include it with your message.